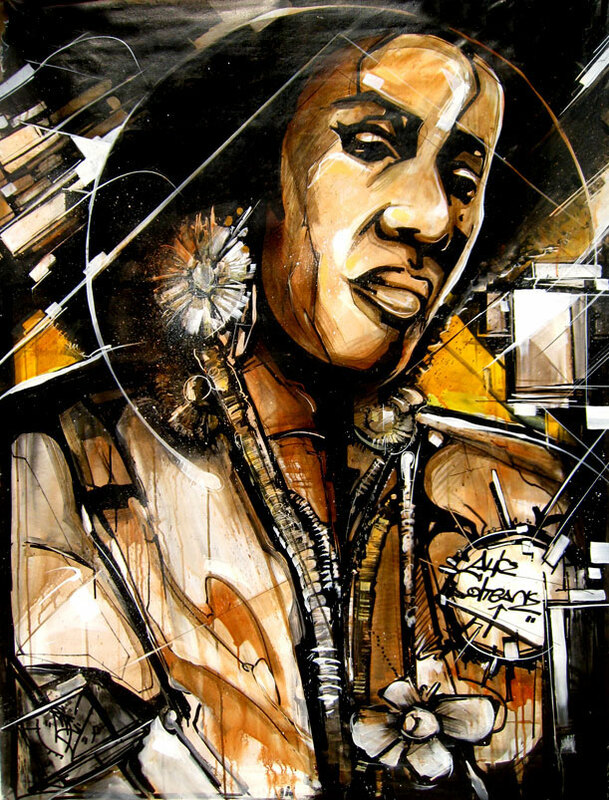 I initially painted this Alice Coltrane piece live in 2004 at a MALATHION event. A Ladybug Mecca Release Party, if I remember correctly. I was never quite pleased with the overall outcome of the one. It needed some adjustments that I just didn’t know quite how to execute at the time. Recently I rediscovered the painting rolled up in my garage during a pre-spring cleaning run, I immediately tacked it to the wall and prepared to update her. Now I was satisfied. I had to make the call to The Gaslamp Killer to let him know I needed to pass this one along to Flying Lotus for his personal collection. First, because he is her Nephew, secondly because I wouldn’t feel quite right making a profit by selling it. The piece is now in FlyLo’s possession and in safe hands.